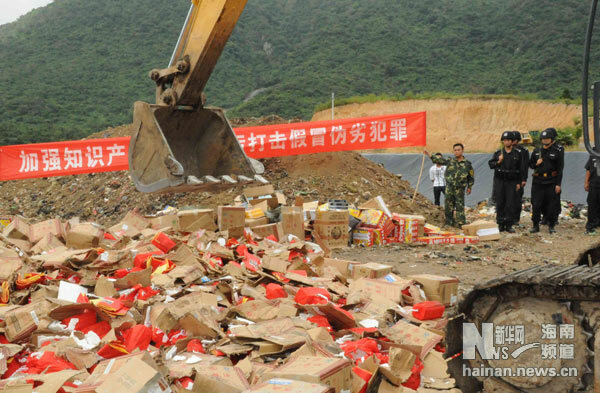 Sanya authorities have announced last Sunday that they have destroyed counterfeit products worth 2 million yuan including alcohol, cigarettes, beverages and DVDs. The crackdown was part of the government campaign against intellectual property rights violators. The crushed items comprised of 280 bottles of fake Chinese wines, 1,000 copied DVDs, 200 cigarettes and 50 boxes of beverages, involving goods worth 2 million yuan. According to the police, they will continue to collaborate with other departments to curb and deter the blacklist of fake products and protected customers’ rights and images of manufacturers.